Snowman crafts and games are perfect activities for winter language-building. Children love snowmen. Even my preschoolers who have never seen snow are fascinated with the idea of snowmen. Who can blame them? There is something magical about snow that changes the world to a fresh white canvas and can be rolled into gigantic balls by mitten-covered children. Build a snowman and you have a new friend in your yard that is uniquely yours, even if he or she is temporary. 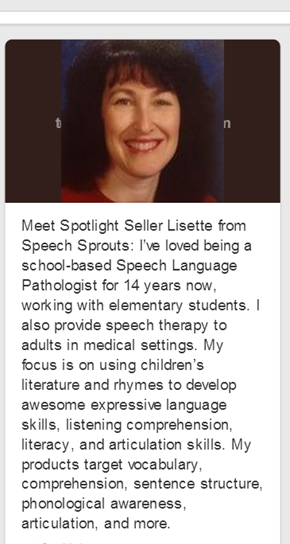 So why not use this naturally engaging theme to elicit all kinds of language and articulation practice too? 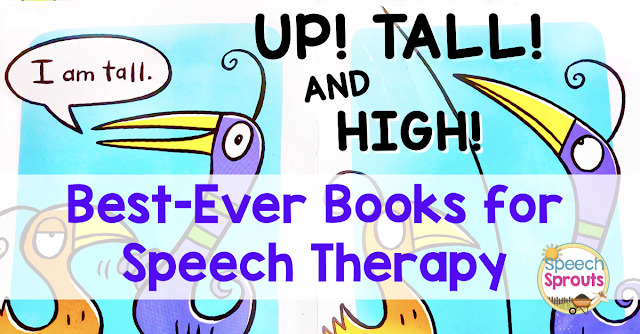 We did just that last week and this week too in speech therapy. 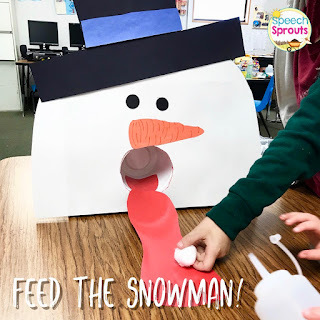 These snowman activities were created for three sessions of my large-group intensive preschool program, but are also terrific for in-class or small groups. Too simple for older children? Nope! My bigger kiddos begged to play the game, and are always up for crafts. On the first day, we read Sneezy the Snowman by Maureen Wright. In this adorable book, Sneezy makes some ill-considered choices and melts several times. You would think he would avoid hot chocolate and campfires. Silly Sneezy! After the story, we made melted snowmen. Didn't these turn out cute? Kiwi Crate shared a similar project, and it is perfect for Sneezy the Snowman! 1. Cut out the snowman parts. Vocabulary: Talk about snowman vocabulary as you talk about each piece. What do you put on a snowman? Maybe a hat, scarf, carrot nose, eyes, sticks, arms, buttons and mittens or gloves. Categories: Have the children tell which items are clothing. What about the carrot? Can you think of other vegetables that would make funny noses? What can you use for eyes and buttons? Which parts do you find outside in nature? 2. Next, paint a swirly snow puddle on blue construction paper. Paint this in the middle, rather than going edge to edge. Talk about how snowmen are cold and frozen until they melt. Things that are frozen and can melt. (ice cream, ice cubes, icicles, ice pops). Verbs and object function: melt, paint, dip, brush, spread What do you do with a brush? Position Concept: Middle. Show me the middle of your paper. Show me the middle of the puddle. 3. Finally, add your snowman parts, scarf and hat on top of the white paint. A dab of white glue will help ensure they don't fall off! 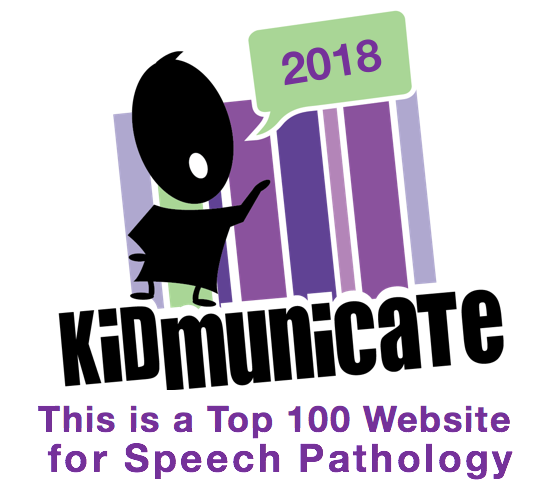 Snowman at Night is another one of my favorite winter stories for speech therapy. The snowmen come alive at night and slide to the park for all kinds of fun snowmen games! After reading the story, we made these cute snowmen, mosaic-style! You will need construction paper, scissors, a marker, and glue. 1. Have your students cut out white squares or use a paper cutter to cut out the squares ahead of time for young children. 2. 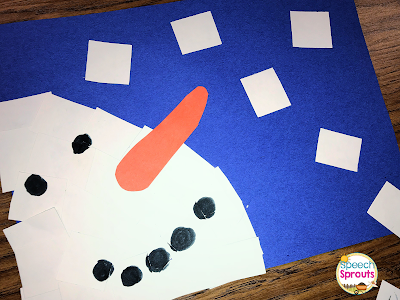 Create the snowman's face by overlapping the squares. 3. Add a carrot nose and snowflake squares. 4. You can draw circles for the eyes and mouth, or use paper circles. In this sweet story, Bear wakes up to a beautiful white world and ventures out to play. The problem is, Bear is all alone, so he decides to build a snowman for a friend. While he is rolling the snowballs, he meets two real friends, Otter and Rabbit who help him, and up up then playing together all day. After the story, we created these easy snowmen. This craft is super simple and easy for your youngest students. Again, pre-cut a few simple parts for young children, or have your older students cut their own pieces. Offer several colors and let them choose! 1. Cut the top off the paper plates. 2. Cut out hats, and noses. you can take a marker and add a "hat-band" as shown. 3. We used our school die-cut machine to cut out circles for the eyes and mouth, plus shapes for hat decorations. 4. Grab some glue and let the children create! Same and Different: When the projects are finished, have children describe how their snowmen are the same as the others, and how they are different. Story retell: Have the children retell how their snowman was made, step by step. Older children can write it out. 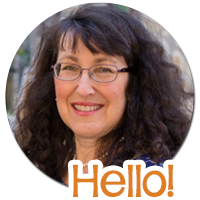 Sequencing and ordinal concepts: What did you do first, then, last? We had a "blast" with this fun snowman game in speech. Watch the video to see this fun snowman game in action! This game was a huge hit! You'll need a box, a plastic cup, craft knife, glue, construction paper, cotton balls or white pom-poms and an empty squeeze bottle. 1. Trace the large end of the cup about 2 inches from the lower bottom of the box. 2. Cut a hole for the cup and insert. 3. Make a snowman face from construction paper on the bottom of the box, and cut over the cup for the mouth. 4. Add eyes, a nose, and a hat. 5. Cut out a red tongue about a foot long and laminate to make it slippery. 6. Glue one end of the tongue to the cup and drape the rest down on the table. You're ready! After your students answer a question or say their words, give them a "snowball" to place on the tongue. Take aim with the squeeze bottle and blow the snowball into his mouth. Fun! 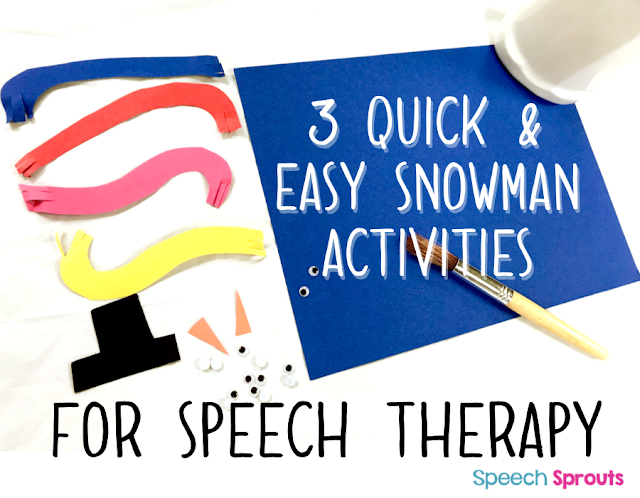 These snowman activities are just right for targeting articulation too. You can practice syllables and /sn/ blends with these activities too so they are perfect for mixed groups. (Sneezy, snowman, snowflake, snip, snow, snowball, sniffle.) When engaged in craft activities, have the children say their word or sentence before they glue each part. If you would like more activities for a great winter story, take a peek at my Snowman at Night Speech Therapy Book Companion. I hope you enjoy a little snowy fun in speech!